As explained in other posts, we decided that our main concern when buying our first motorhome was finding a good deal. Unlike the guides we'd read that suggested we first create a narrow wish list of specifications before we started searching we found it far more practical to develop a good sense of the overall market and only then develop an online searching strategy that would sift among the thousands of motorhomes for sale and highlight the small handful of preferences we did have. But as we developed our knowledge of used motorhomes and started to filter the options available to us we first found ourselves in a bit of a dilemma, with an apparent choice to make between price/resale potential (i.e. the risk we'd lose money) and reliability (the risk we'd spend the year fixing the motorhome). Trying to work out which end of the motorhome price spectrum we should be looking at to balance these two risks was very hard. When we were looking for our first motorhome we didn't really know how long we'd want to own a motorhome for or what we were really looking for in a motorhome at all (as we had no prior experience of motorhome life). Since we hadn't originally planned a motorhome trip this was an expensive and unexpected purchase for us, eating up a large part of our savings, so we wanted to make sure if it didn't work out for us that we could recoup as much as we could as quickly as possible. This also meant we wanted a more "standard" motorhome rather than anything too unique or quirky that we might personally like but might not have much mainstream desirability. So in a way, for us, it was about minimising the chance that we'd lose money on our first motorhome and we wanted something that was going to hold its value as well as being fairly priced. We looked at a very wide budget range trying to find what we considered the best deals and in the end we considered all options under £20,000. Our original preferred limit had been £10,000, which we felt more comfortable spending, but very quickly we found that increasing the price range, first to £15,000 and later £20,000 revealed a lot more good deal options in the sense of resale potential very quickly. Perhaps we are a little more risk averse than others, particularly given the stress we were under after my post operative infection scare, but we wanted something we would feel confident and safe in whilst driving on unfamiliar roads in Europe. We also didn't want to be spending lots of money on unexpected repairs on top of the expense of buying a motorhome in the first place, plus the additional time and stress this would bring while we were supposed to be enjoying ourselves. Although we know you cannot guarantee reliability on any second hand vehicle (you don't know how a van's been driven, stored, looked after in between MOTs etc.) we did feel that there were certain parameters and correlation/likelihoods we could use to suggest reliability. We felt that miles/age was a good place to start and so once we'd done a broad search, we'd sift through as much as possible and, where we could, selected motorhomes less than 15 years old and 70,000 miles. After that a good service history was also a must for us. Us and our families have always been very conscientious with the upkeep and the subsequent record keeping of our cars' service history over the years and we felt a good and full service history was indicative that the owner(s) had cared for and looked after the motorhome. A note about dealer warranties: We did initially wonder if all of our concerns about reliability might be better answered if we just bought from a dealer offering a warranty. However, after reading the small print on several policies, we didn't feel they offered much peace of mind and too many 'get outs' through 'fair wear and tear' when you were buying a lower priced older motorhome. Dealer prices tended to be several thousand pounds higher, partly because they were (in our opinion) trading off the illusion of being covered by a warranty. In the end we decided that it was better to save this additional premium, buy privately and use the savings to start our own 'repairs' fund. 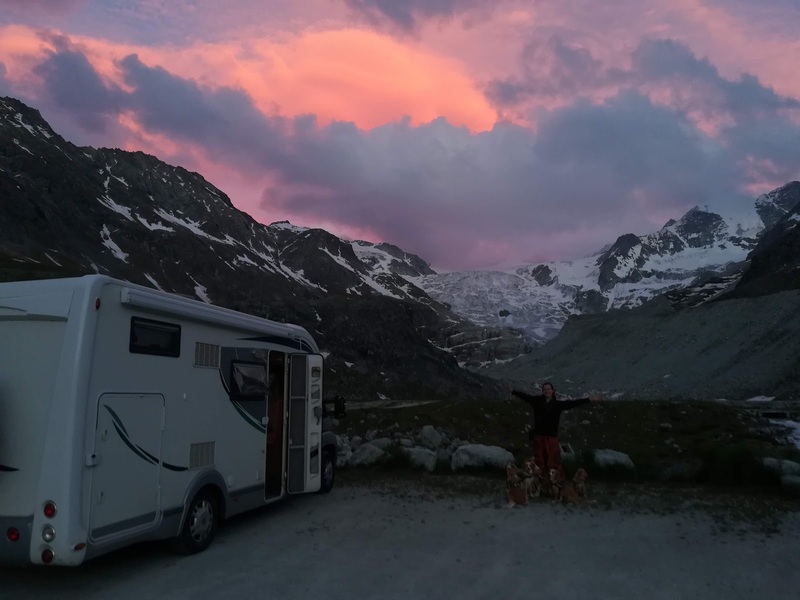 With our focus on not losing too much money on our first motorhome purchase we realised that we had a dilemma as there were two completely different ways to proceed. One option we had was to buy a really, really cheap motorhome, say for £3000. There were some very old, very high mileage motorhomes on the market at the time that we did seriously consider with this price tag. If we bought one like that, we reasoned, even if the entire motorhome had to be written off that the most money we could lose before looking to buy another one was that £3000 (plus perhaps a few repairs along the way). This approach would also mean that if nothing did go wrong but we still wanted to sell the motorhome a year later it wasn't likely to have depreciated any further anyway. But on the downside we were very concerned about reliability (and safety) for some of these motorhomes and didn't want to spend the year doing running repairs and wishing everything worked properly. Alternatively, at the other end of the spectrum, we could spend a lot more money on a much younger, very low mileage motorhome that had been well cared for which seemed to be costing between £14,000 - £20,000 at the time we were searching. This, we felt, would hugely increase the possibility of a reliable and safe motorhome and we would worry less about breakages and probably enjoy the habitation a lot more as well. But, the worry was that on a motorhome where it was expensive because it had hardly been used, our adventure could depreciate it quite considerably and we'd lose money that way if we decided to sell it. Plus if there was a catastrophic problem or accident we stood to lose a lot more! It really did feel like a choice between the risk of losing too much money or getting a motorhome that was likely to be reliable, and both options were a gamble and could go either way. While we were looking at motorhomes we stayed as open as possible to all options and as part of our decision always tried to work out where on the spectrum above a particular motorhome was. However, in the end our mind was made up for us when we first met "Homer". We got an email alert, decided that the motorhome, although more than we had wanted to spend, was a great deal with very low mileage (13,700) for it's age (10 years old) and it was in almost immaculate condition with just one owner from new. We reasoned that even if we added 10,000 more miles within the year that it would still be a very low mileage motorhome and hopefully retain much of the price tag we were paying. It was also the youngest van we had found in our price bracket at all. In the end, although we didn't really have to choose we still feel that the considerations above were an essential part of our motorhome search and one of the key factors in helping us recognise Homer as being such an amazing deal. Whether this strategy works out for us, only time will tell but so far people we've met have been very complementary to Homer!